If you haven’t heard by now, eating dietary fat doesn’t cause weight gain. But too much sugar does. The notion that fat makes you fat has dominated our culture and public policy for over five decades, but as nutrition science has evolved we finally now understand that dietary fat doesn’t necessarily make you fat. In fact, good fats in the right amounts are vital to a healthy body. There’s still ongoing research on this topic, and other factors like artificial chemicals and hormones play a role, but by all accounts we now understand that the overconsumption of sugar is often the main reason why people store excess weight. But before we dive into how sugar can make you fat, a short history lesson is in order so we can understand how the sweet stuff became such a huge problem, and why you might still be struggling with losing weight no matter how hard you try. Ever since a doctor named Ancel Benjamin Keys conducted a large study in the 1950’s showing that overconsumption of fat was contributing to the rise in heart disease happening at the time, American culture has been hooked on the idea that fat is bad, making everything else in comparison seemingly ok. When consumers began avoiding fatty foods like cheese, cream, meats, nuts, butter, etc., the food industry had to come up with ideas to keep selling products that tasted good despite not having the savory flavors usually accompanied by fatty ingredients. You see, fat equals flavor. When you take out the fat, you’ve got to replace it with something appealing. Manufacturers started adding sugar, and lots of it! Even in savory foods. Crackers are a good example of this. Check out the nutrition label on fat-free crackers and you’ll see boatloads of sugar listed. One important distinction: always go for fat from natural sources. Trans fats are created in a laboratory through a process called hydrogenation and should never be consumed.1 Trans fats are usually accompanied by the word “hydrogenated” on the ingredients list, and common sources include Crisco and margarine. Back to sugar. Couple the faulty studies on fats with an economic boom in the convenience foods industry in the 90’s and consumers were inundated with exciting new product labels featuring words like fat-free!, diet, 0%, heart-healthy, and other gimmicky marketing lingo. If you start looking more closely at your food labels, you’ll be amazed at where you’ll find incredibly high amounts of sugar — even in so-called “healthy” products. So, what’s the problem with too much sugar? First, sugar is void of nutrients and crowds out other nutrient-dense food that your body needs to thrive. When you start your day with a Frappuccino or blueberry scone, you’ve missed the opportunity to eat (i.e. crowded-out) a nutrient-dense meal like eggs or a plant-based smoothie. Next, sugar doesn’t fill you up or satiate your appetite, and often leaves you hungrier an hour later than before you ate. Naturally occurring fats do just the opposite. Eating healthy fat not only satiates your appetite, it contributes to healthy organs and glowing skin. And finally, excess sugar consumption can spike your blood sugar out of the normal healthy range setting off a cascade of insulin ups and downs — often referred to as the “high-glycemic rollercoaster” — which can cause you to feel even more hungry, have mood swings (hangry anyone?! ), store excess fat, and worse, lead to metabolic syndrome (aka pre-diabetes) and even type 2 diabetes. The important thing to remember is that not all sugars are created equal. Let’s say you eat an apple that contains about 18 grams of sugar. However, that sugar is combined with fiber to slow down its absorption, as well as good-for-you antioxidants that contribute to your overall health. It’s not the same as eating a cookie that has the same amount of sugar that would cause an insulin response right away and not give you any health benefits. The World Health Organization recommends about 25 grams or less of added sugar a day. In comparison, a can of soda has about 40 grams and a typical store-bought granola bar has about 10–20 grams. So, if you’re snacking on something sweet more than once a day chances are that you are exceeding the recommended daily limit. Sugar hides in mysterious places, even savory tasting foods. You already know the obvious places like sweet treats. Drink more water, especially before snacking. Sugar cravings can be an indication of dehydration, so try a glass of purified water first to see if you’re really hungry. In general, aim for half of your body weight in ounces of purified water each day. 2. If you need to sweeten something, use a natural sweetener. When you are going to eat something sweet, use a natural sweetener that inherently comes with some vitamins and minerals, like raw local honey or maple syrup. Always avoid artificial sweeteners. Read about the best natural sweeteners here. 3. Eat enough at mealtime. Snack foods are the most common sources of excessive sugar, so try to reduce the need for snacks by eating enough during meals. A simple salad for lunch might sound like a healthy option, but not if it leaves you hungry and more likely to reach for unhealthy foods an hour later. 4. Reach for protein, healthy fats and fiber-rich foods, especially for breakfast. Whole foods like beans, quinoa, nuts and seeds, and organic eggs are loaded with nutrients and will make you feel satisfied so you’re less likely to crave excess sugar. Aim for at least 15 grams and up to 20 grams of protein at each meal and always incorporate about a tablespoon of a healthy fat and some type of fiber, too. Check out my post on coconut oil if you need some inspiration on how to incorporate even more healthy fats into your diet. 5. ALWAYS read the label. It may be obvious that a chocolate brownie will contain sugar but you’ll be amazed at how many other products are loaded with sugar like the ones mentioned above. Look at labels, compare products, and go for which ever has fewer grams of sugar per serving. 6. Make your own food as much as possible. Home cooking is really the best way to know exactly what you’re eating and control the quality and quantity of what you consume. As with anything, the key is all about mindfulness, balance, and moderation. Cookies and other desserts taste great, especially when they’re homemade with lots of love, and you shouldn’t deprive yourself of enjoying an occasional treat. Just remember that occasional means once-in-a-while, and “treats” should still be made with quality ingredients. If you notice that you’re eating fruit for breakfast, sweet snacks after lunch, and having dessert frequently, plus drinking juice throughout the day, then you might want to consider replacing those sweets with other foods. I promise you’ll feel a world of difference in your energy, and possibly in your sleep, skin glow, mood, aches and pains, and all kinds of other beneficial effects. Here’s an experiment to measure how much sugar you’re really eating: write down everything you eat in a day, without judgment. Use the ingredient labels or Google estimates for how many grams of sugar each food has and add it up. If it’s over 25 there’s no need for outrage or self-criticism, just be a little more attentive the next day and keep trying to dial it back until your taste buds adjust and you find your sweet tooth satisfied with more whole foods. 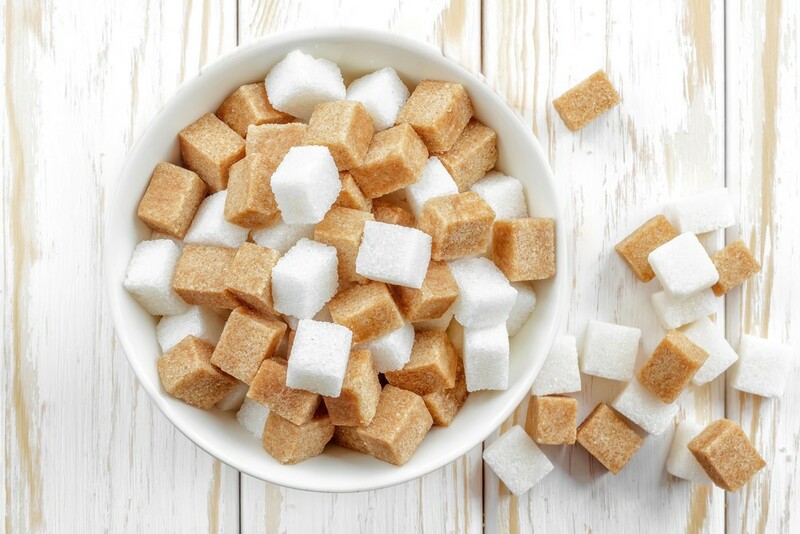 Want to learn even more about cutting down on sugar? Check out my 10-Step Clean Up Your Diet™ program. 5 Fitness Industry Myths: DEBUNKED!